On Friday night my family and I went down to Bowral in the freezing cold, it was truly beautiful and the air was so crisp however I think I nearly froze to death. On the rainy Saturday morning we got up and went into the town, had lunch at a cute country cafe and found a fantastic cookery shop. I instantly fell in love with the shelves and shelves of cook books and appliances and just couldn’t help myself but to buy nearly half the shop. So here I am with my new tart tins, flan tins, thermos’s and my brand new baking cook book (called Gran’s Sweet Pantry). As soon as we arrived home I was just desperate to try out a recipe and that is exactly what I did. My eyes instantly stopped at this slice recipe. I knew I just had to make it then and there. So here it is…. In a food processor blend the biscuits and pistachio (or if you don’t currently have one, like me :(, crush and mix by hand). Then in a bowl add condensed milk, melted butter and zest of one lemon to the biscuit and pistachio crumb. 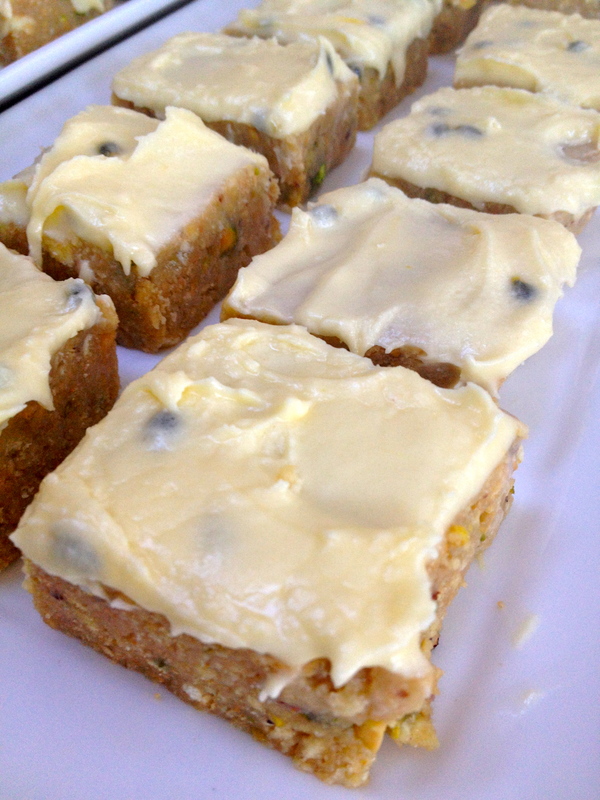 Once all the ingredients are well combined, place the mixture in a slice tin or a shallow baking tray and press down firmly. Then place in the fridge whilst you crack onto the icing. No slice would be complete without a sweet, sugary icing to top it off and it’s just too easy to make! Start by sifting the icing sugar into a medium bowl. Then add the butter, some passion fruit pulp (for a hit of acidity) and finally some milk until the consistency is nice and smooth. Now to finish it off… Take the slice out of the fridge and spread the icing on top. 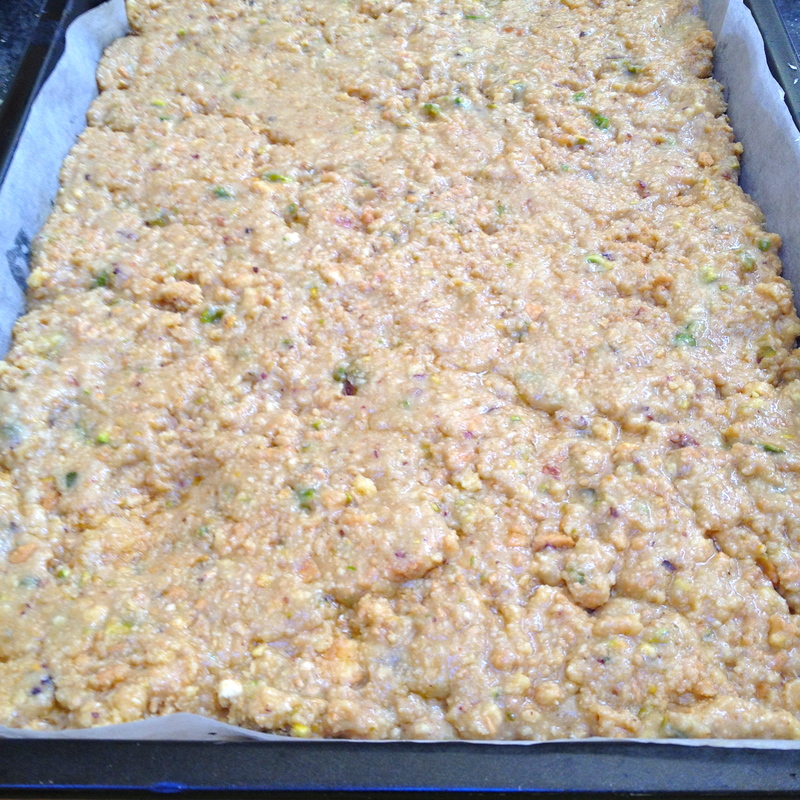 Then all that’s left to do is chill it for another 2 hours in fridge and then cut into squares of rectangles. Now your’e done! 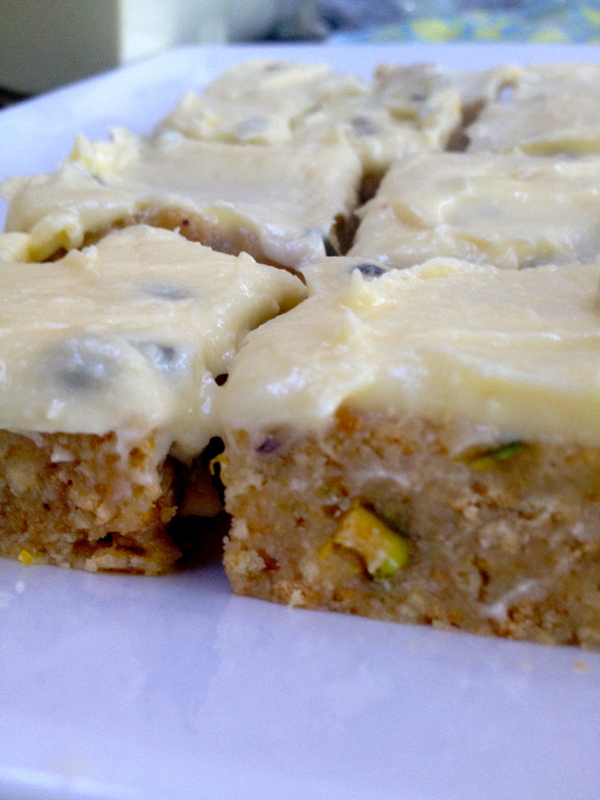 Woola..easy peasy passion-pistachio slice yumminess! !